As brands are challenged to remain relevant in increasingly competitive environments, a handful of common factors tend to predict success and staying power. As originally published under the title,“Brand Building for the New Millennium,” in DMI:Review Vol.27, Issue 2. From a stroll down Singapore’s blingy Orchard Road to a dusty stop in Marfa, Texas, to a peek inside the pantries and medicine cabinets of any of millions of families, it’s obvious that brands play a critical and undeniable role in our modern world. Brands grace everything from a humble bag of flour to the rocket ships that promise to take humanity to wholly new places, and yet the means for creating, nurturing, and valuing brands often remains opaque, at best. We can define a brand as the sum of all the tangible and intangible aspects of a product experience. Or, said more colloquially, a brand is a promise of the next experience a person will have with a product or service. But why do some brands succeed wildly, while others fall flat? How are brands changing, and can they possibly keep up with consumer expectations? With a caseload that spans from category-leading global brands to feisty startups, we at LPK ask ourselves these questions regularly. Indisputable answers do not exist, but a complete examination suggests some concepts, guideposts, and principles that separate the mundane brands from the extraordinary ones. As brands of all types are challenged to remain relevant in an increasingly connected and competitive environment, I have observed a series of common factors that tend to predict success and staying power for the brands that wield them. As we engage in the construction and development of a brand, I believe it’s essential to consider a myriad of drivers—how people make decisions, how consumer values are evolving, and how businesses win in the marketplace. In effect, the challenge is to connect with the heads (i.e., the rational), hearts (emotional) and guts (primal) of an audience. The strongest brands possess a visceral appeal people can feel—something primal that gets under their skin and moves them for reasons they can’t explain. Long the domain of image-based categories (think fashion, fragrances, and spirits), this type of “gut appeal” has nonetheless managed to be incorporated into more accessible brands, like Method, Pringles, and Evian. It requires brand builders to temporarily set aside many of the tangible aspects of the brand experience and instead embrace the less concrete concepts of desire, pleasure, and fear. This may be more difficult to rationalize, but cognitive science assures us that actually, most decisions are a finely-calibrated combination of feeling as well as reason. At the close of the first decade of the 21st century, people began to move beyond using brands only for status and identity and began to look to brands as a path to meaning. The business world was experiencing a similar evolution. Simon Sinek’s TED Talk and subsequent book, Start with Why, encapsulated this message, suggesting that most brands had inverted the equation when communicating with consumers. They talked about what brands do and how they do it, but they rarely share why they do it. Sinek suggested that brands should start from the inside out—from the why to the how to the what. A distinct point of view on its product, category, and culture is essential to animate a brand, its purpose, and to earn consideration in the hearts of an audience. The articulation of a purpose statement or a belief system necessitates that a brand identify “what matters” beyond its quest for bottom-line profits. A distinct point of view on its product, category, and culture is essential to animate a brand and its purpose, and to earn consideration in the hearts of an audience. Although cognitive science establishes emotions as a key driver of behavior, the consumer’s critical mind seeks data to reinforce those choices. As Douglas Van Praet wrote, “We are not rational. We are rationalizers.” The development of a brand pyramid is squarely targeted at providing the brain with all the evidence it needs. 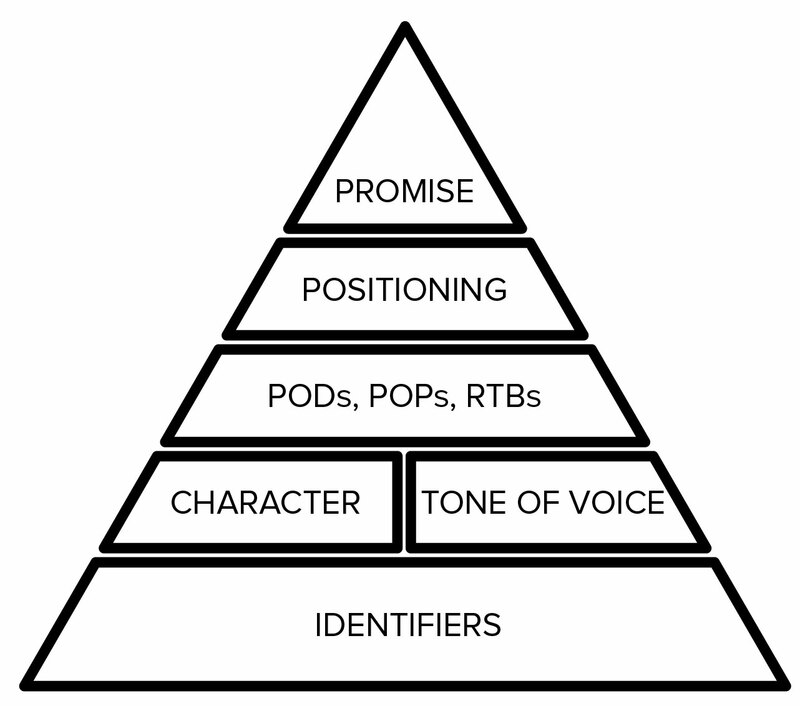 The pyramid captures the fundamentals of brand strategy—promise, positioning, points of difference—ensuring that competitive advantage is identified and articulated. In defining the brand strategy, practitioners must use an approach that thoughtfully examines aspects both internal and external to a brand and a business. Efforts should begin with an exploration of the heritage, assets, culture, and aspirations of a brand. Only by understanding what was and is core to a brand can one responsibly chart its course into the future. The work here is to understand the origins of the brand and what—from the point of its inception and throughout its lifecycle—has provided it with the meaning that will serve as inspiration to take it forward. In conjunction with a look inside the brand and the organization, one also must consider what is occurring more broadly in the world to ensure that we craft a brand that will resonate within an ever-dynamic and changing context. Do this by examining the consumer, the market, and the greater culture. The consumer is the brand’s muse. A brand that does not take into account consumers’ needs, wants, and desires cannot claim a relevant place in their lives. This work of understanding can take many forms and is limited only by a team’s imagination, calendar, and budget. In addition to understanding the consumer, it is also imperative to have an air-tight grasp on the category in which the brand competes. Defining the key attributes of a brand’s toughest and most consequential competitors—both traditional foes and new disruptors—ensures that you can articulate a differentiated story and set of actions for the brand. Also important is a look at the cultural forces that are dominant today as well as those that may be emerging in the near future; this will allow us to design solutions that will align with consumers’ shifting values and expectations. 2. Say less, do more. A comprehensive brand strategy that includes purpose, beliefs, and brand pyramid is only meaningful when it drives a brand’s behavior—in other words, that moves beyond messaging and into action. The need for brand strategy to incite action reflects the ongoing evolution of the role brands play in the lives of consumers today. Wonderful examples abound of brands that activate their values in meaningful ways. Outdoor clothing brand Patagonia delivers on its mission statement to build the best product, cause no unnecessary harm, and use its business to inspire and implement solutions to the environmental crisis by supporting Worn Wear, a sustainability program (one of many at Patagonia) designed to “celebrate the stories we wear, keep your gear in action longer, and provide an easy way to recycle Patagonia garments when they’re beyond repair.” With this initiative the brand overtly suggests to its consumers to consume less. In line with its ecological beliefs, Patagonia provides a service to help people repair their Patagonia stuff and use it longer, putting off another round of purchases in the name of sustainability. Among our clients, the work of Always can be instructive. The feminine care brand struck a cultural chord with its 2014 #LikeAGirl campaign. But more than a series of compelling YouTube videos (with more than 100 million views), Always promises to wage “an epic battle to stop the drop in confidence girls experience at puberty.” The brand then delivers via a series of education and outreach programs, including the Always Confidence Teaching Curriculum, the Always #LIKEAGIRL Confidence Summit series that has run in 10 cities, and the development of unique TED-Ed educational videos. Conversely, cautionary tales seem to show up in our newspapers and Twitter feeds almost daily. Aided by new technology, a brand’s actions are increasingly transparent and trackable. Be it Volkswagen, Chipotle, or Lance Armstrong’s Livestrong, when what a brand says does not align with what a brand does, the repercussions from consumers are often swift and unforgiving. The more we experience something, the more likely we are to remember it. So a brand’s ability to create and manage a set of distinctive experiential assets is essential to its long-term viability. Successful brands analyze their assets and discover the most effective, memorable, or advantageous ones in order to enhance instantaneous recognition and recall. This not only includes the expected assets, such as logo, color, icon, and tagline, but can also extend to alternate ways—scent, taste, or pattern, for instance—a brand can imprint itself in the minds of people. Brands must balance the disciplined use of these core assets over the long term with fresh and engaging executions to create new interest and distinction. For years, bourbon brand Maker’s Mark has used its unmistakable red wax seal to stand among the countless other choices found in bars and on store shelves. The brand traces that seal back to the very first bottle rolling off its assembly line in 1958. Maker’s has over-invested in this asset, featuring it as the central character in a long-running advertising campaign and making the dipping room a stop on the tour of the company distillery in Loretto, Kentucky. Notably, when the brand took the audacious step of introducing the bolder-tasting Maker’s 46, LPK and the marketing team were careful to maintain the red wax seal as a way to signal identity, quality, and origin. There are plentiful additional examples of brands that thoughtfully and intentionally use design assets to prime audiences to notice and ultimately understand a brand’s communication. From the classics (Tiffany blue and Burberry tartan) to more modern inventions like the red soles of Christian Louboutin’s high-end heels, these distinctive brand assets reinforce positive brand memories—associations that lead consumers to recognize, consider, and select the brand. Dynamic brands demonstrate the ability to consistently connect with the shifting values, attitudes, and behaviors of the future by contextualizing change and identifying newness. This ability manifests in product development, go-to-market design, and communications and media decisions. Without the faculty to understand emerging trends and cultural forces, brands will be caught flat-footed, in danger of falling behind more agile and insightful competitors. Look no further than the generational changes impacting the food and beverage industry today. Long-time category leaders are in the midst of multi-year slides, unable to cope with a consumer base increasingly interested in real food, fresh ingredients, and organic options. Up-and-comer yogurt brand Chobani, for instance, grew to be a billion-dollar brand in just five years by giving consumers the right mix of health, taste, and values—while its more-established competitors mostly watched. Without a strategy to guide both innovation and expansion, it is unlikely that a brand will be able to repeatedly climb the figurative mountains placed in front of it and grow to its full potential. Brand architecture takes into account emerging consumer needs and competitive threats to chart an intentional future. A brand’s architectural framework organizes current offerings in a clear and meaningful way for the internal stakeholders in the business as well as its external audiences. It creates a blueprint to understand and shop the brand as it evolves and expands. Today’s rapidly-changing landscape presents a challenge for those managing and investing in brands. Traditional powers are being upstaged by radical startups at a dizzying rate. Technological advances are regularly lowering barriers to entry and eliminating structural advantages. The work of brand-builders must be more disciplined, more aggressive, and more thoughtful than ever before. Brands that are most likely to rise above the others will take a multi-faceted approach, focus on action, invest in brand identifiers, and anticipate shifts in the marketplace.